This important piece by Valerie Strauss together with Lisa Guisbond from FairTest (see below) expresses deep concern about computer-based, standardized testing and associated curricula that are seeping into our nation's classrooms like wildfire. Ironically enough, this could involve more, rather than less testing, dissolving gains made by the anti-high-stakes testing and opt-out movements. What I am struck with is something that is not addressed herein—that is, how under this decades-old, high-stakes testing regime that in Texas dates back to the early 1990s is that today's teachers—many of them who only came of age under this current system—are easy prey for the machinations of an evolving testing industry atop those that already frame the world of teaching under NCLB and now ESSA. To be sure, in colleges of education, we do teach future teachers and model as well, project-based learning (PBL), portfolios, action research, formative assessment, authentic learning and assessment together with deep theoretical understandings, including sociocultural and sociopolitical perspectives that impact schools and how children learn. Despite this knowledge that at least our teachers learn, classroom teachers face a different set of realities in test-driven, environments together with pressures, particularly as novice teachers, to simply "follow the script" that they either know—or are encouraged to know—all too well. Speaking generally, it seems fairly obvious to me that the many years of testing's drumbeat have created a vacuum wherein our teachers, leaders, and very oftentimes, our school board members themselves are simply not equipped with alternatives—with other ways of knowing and being in the classroom, and thusly, in the world. As a consequence, they fail to step up to the plate to articulate a different, more robust, creative alternative to pedagogy that does not sacrifice both knowledge and intellectual curiosity on the pedestal of mental testing. We clearly have to begin to re-imagine all of this from the inside out. Practical, if not urgent, reasons for doing so also exist, in my view. Take, for instance, this recent report of a frightening ordeal for Corpus Christians who were deprived of water for close to four days (you can read about in this in detail in this Texas Monthly piece here). What comes to mind is an optimal curriculum alternative, that ES, if well executed, provides. Can you imagine this happening to you or your community? Late last Wednesday night [December 14, 2016], a city-wide notice was issued alerting residents to stop using tap water for anything at all, including for drinking, showering, or brushing teeth. The city also told residents that there was essentially nothing they could do to make the water any safer, including boiling it, “freezing, filtering, adding chlorine or other disinfectants, or letting the water stand,” according to a city news release. Details of the reason for the ban were not immediately made clear, but it later emerged that Indulin AA-86, a chemical asphalt emulsifier, had leaked from a private industrial site into the water supply, due to what is believed to have been a “backflow” problem. Surreal. What don't we need water for—good, clean water? While the issue was ultimately resolved, prior water safety problems over the last 18 months on four separate occasions are unsettling. At least with the previous three scares, water could be boiled, but not with this most recent one. Residents faced long, snaking, lengthy lines of thousands of people assembled for whatever water the city's retail stores could provide. The governor even provided an emergency shipment of barrels of water for the city's residents. Schools closed down, as did many businesses. In short, this lack of quality water paralyzed virtually an entire city and made life very uncomfortable for everybody for a few days. I heard a story from a friend about having to bathe with four cups of water! So rather than either infantilizing kids or numbing their minds with tests, what we need is a rigorous curriculum that will empower youth, and as a consequence, parents, families and communities with the knowledge, skills, and dispositions they need to have to take initiative as budding researchers, policy analysts, and problem-solvers in a complex world and society. A guiding question can be, "From a policy perspective, what can be done to ensure water quality for all?" Entire schools and classrooms can in fact develop thematic, interdisciplinary units threaded across the curriculum in say, water contamination, and test hypotheses pertinent to ecological racism or classism about which much has already been written or theorized. This can even get considered from a global perspective given that access to quality drinking water is a fundamental need and human right. They could research the roles of agencies like the Texas Commission on Environmental Quality and the federal Environmental Protection Agency to determine how water safety and quality are measured. Working together with scientists or city officials, our youth could conduct regular tests of quality of our cities' water sources. Flint, Michigan's water catastrophe could get researched from a historical or policy perspective to get a sense of the antecedents that not only resulted in the catastrophe, but also the delayed response by city officials. Community organizing and mobilizations could draw on social movement literature to investigate effectiveness of community networks, power, and voice in resolving the water crisis. Students could attend (or view video archives) discussions of city officials' discussions of water resource allocations to see if their elected officials are cutting budgets, and thusly, capacity in areas as vital as this. Students could map the political landscape to see who is researching water quality and consider, as they read, the extent to which research itself is fraught with possible interests and thusly, biases. Who is funding this research? The industries themselves? Do their findings concur with that of independent scientists or university researchers? If not, why not? And what do we know about the city's water infrastructure in relation to its water supply and quality? From a global perspective, World Health Organization statistics could be used to provide added perspective in terms of how many people today live without clean or safe drinking water and what world leaders have done to address this. Water was vastly important to our ancient forbears, as well. With a possible focus on ancient waterways (check out this National Geographic piece on Angkor) that help make the case that water isn't simply necessary but also sacred, offering a rich, multicultural perspective that can potentially expand our children's imaginations. On our continent, the ancient water systems in Querétaro, Mexico and Mexico City are also fascinating. In Texas, students could engage legislative attempts such as with House Bill 655 from the 84th legislative session in 2015 that sought to address water evaporation losses via aquifer storage and recovery in order to meet the state's future water needs. Students could investigate why the bill did not become law and if re-filed, track the bill throughout the upcoming session the begins in January. They could open up an account here at the Texas Legislature Online website and receive regular bill alerts. They could potentially develop arguments and attend or even testify in a future House committee hearing when the bill gets scheduled for a hearing. They could reach out to their local representatives to see what position they take on the proposed legislation. This would further simultaneously open up a parallel universe of legislative activity that could incite their interest in other areas of policy. They could also potentially acquire a sense of competing or parallel policy streams. What, for example, might HB 655 have to do with House Bill 40 that became law last session? What distinguishes the success of one over the other? Students could conduct a policy history of House Bill 40 that placed a ban on bans against hydraulic fracturing—or "fracking" passed by voters across various Texas cities like Denton. Fracking is a controversial form of drilling for gas through the use of a high-pressure mixture of water, sand and potentially carcinogenic chemicals injected into rock that environmentalists say could contaminate underground water supplies. Among other things, this struggle in Texas will illuminate the power of the energy lobby over cities themselves whose voters have passed anti-fracking ordinances. The recent struggle over the North Dakota Access Pipeline about which many resources are readily available online could get scoured, including Twitter and Facebook searches based on the #NoDAPL movement. In San Marcos, Texas, the Indigenous Cultures Institute annually hosts a Sacred Springs Powwow that accords great emphasis to water rights, history, and issues associated with Central Texas spring water that the students could also attend. Artistic exhibits or theatrical performances could provide a summative presentation that parents and the community could attend, alongside perhaps classroom or poster displays of all the different water projects taken up by individuals or classrooms across the school. For added parent and community involvement, the school could host a viewing of the film, Even the Rain (Spanish: También la lluvia), featuring actor Gael Garcia, to learn about water rights and disputes in Bolivia and follow with a discussion that extends the conversation to local contexts. An entire community can be involved in this kind of curriculum. An excellent archive that has just become available that could get mined is the "Mission, Tx contamination archive." Located two-and-a-half hours south of Corpus Christi, Mission, Texas is the birthplace of Monsanto Ag that produced most of the toxic contaminants that they used and sold nationally and worldwide—and with disturbing, long-term effects on the environment, seriously harming children and adults exposed to these toxins. The impact of lead and other contaminants on the body and on children's developing minds would make for a great focus in biology. In chemistry, this piece titled, "Lead Poisoning: Bringing social justice to chemistry, would be excellent for examining the science and geography of lead poisoning. From a public health perspective, here is a great book by Gerald Markowitz & David Rosner on the topic titled, Lead Wars: The Politics of Science and the Fate of America's Children. Listen to this amazing, if troubling, interview of them on National Public Radio (NPR). This focus could either be singular or part of a larger one on the environment. To that end, I strongly recommend A People's Curriculum for the Earth: Teaching Climate Change and the Environmental Crisis edited by Bill Bigelow and Tim Swinehart. Rethinking Schools, generally, is an excellent resource for progressive educators similarly wanting to infuse the curriculum with courageous conversations, thinking, and projects for different age groups. These are just a few ideas that come to mind. The reason that they would fit well in an Ethnic Studies curriculum is because ES is committed to social justice and contextualized, culturally relevant learning that addresses children's lived realities, wishes, and needs, while tapping into local opportunities and resources, including the funds of knowledge that they enter schools with. Important caveat herein. I in no way mean a watering down of ES. ES should be and remain critical, attuned to issues of history, race, identity, language, culture, colonization, assimilation, white privilege, modes of incorporation, race-class-gender stratification, majority-minority relations, intersectionalities, policies that maintain heierarchies, subaltern epistemologies, and the like. ES requires a deep understanding of the ethnic minority experience in the U.S. that has been amply research by scholars in Mexican American Studies, African American Studies, Native American and Indigenous Studies, and Puerto Rican/Boricua Studies. Feminist scholarship—including African American, indigenous, Asian, and Chicana feminist perspectives—is also integral to this endeavor. What I see here is a convergence in opportunities. On the one hand, is this critique against high-stakes, standardized testing. On the other is a social movement for ES. Stated differently, our opt-out, anti-high-stakes testing movements could join forces at the grassroots level with the call by community advocates for ES. All converge on an arguably 21st century imperative for contextualized learning and powerful learning experiences. Plus, many of us already know of, or know, like, and respect each other. This is an asset-based curriculum and pedagogy that sees youth as resources themselves for the kind of thinking needed to generate ideas and address social problems. Not that this cannot be accomplished outside of ES, but since structurally speaking, ES falls outside of the high-stakes testing mill, it provides a clean canvas on which the best of our thinking pertinent to curriculum, pedagogy, and ES can get drawn. Tests aren't essential for this learning to be "high stakes." It's high stakes enough taking on a politicized issue like water quality, and even more so, a corporate polluter. That is, students could conduct research that doesn't simply sit on a shelf, but becomes actionable through an engaging of "all stakeholders to the reform" as part of the curriculum itself. This approach to pedagogy is called, "Action Research" or "Participatory Action Research (PAR)." PAR facilitates powerful learning experiences that provide students with a sense of self-efficacy and not just their right, but indeed, responsibility, to deploy their talents, skills, and time in the service of humanity to make the world a better place. PAR conceptually overlaps with project-based learning (PBL) that provides students with "hands-on" (or "minds-on") learning experiences that position them to be potentially transformative in real-world, meaningful terms. To learn more about what this kind of pedagogy looks like, check out my recently published book titled, Growing Critically Conscious Teachers (TeachersCollege Press, 2016). Once the research is done, students and faculty could hold public convenings in the school cafeteria and hold city officials and corporate chiefs accountable. If any disregard such overtures, that's data, too. A classroom blog could out such officials so that the public can take this into consideration either in terms of who represents them best at the ballot box or for possible investigative, legislative or judicial action. Regardless of the outcome, the value of defending one's research is about as high-stakes as it gets, approximating the kinds of challenges and environments that they can hope to encounter in many a college classroom—especially at the graduate level where doctoral students customarily defend their doctoral theses. Aside from an engaging classroom experience, I see a few research papers and policy briefs here that are actionable. I also see a rich, muticultural experience that extends learning and makes it memorable. Plus, unanticipated career options and possibilities could come into view. With teachers as facilitators of this pedagogy, our young people can begin engaging these issues in real time, adding immediate value to our collective quest for solutions while they are young, rather than at some later point when condescendingly—I might say—they're presumed to be "old enough" to do so. This is not only much more interesting and challenging than either a standardized or test-based curriculum, but by putting them in a position where they themselves can exercise their intellect, voice, and agency, honors them as free and independent thinkers, as well. In the meantime, Lisa Guisbond lists a set of helpful responses to this new and unfortunate standardized testing craze in terms of what parents, students, and educators can do to counter it (see below). To that list, I would add: Talk to your school board members about supporting Ethnic Studies in your school. Corpus Christi community, relatives, friends, and colleagues, what happened there was severe, as you know. Feel free to respond to this post to share your perspective and otherwise let me know how I may be helpful. I am aware of excellent PBL in some of your schools. Not sure about Ethnic Studies. Last year, the Obama administration conceded that U.S. public school students were taking too many standardized tests, this after after a revolt among students, parents and teachers, and after a two-year study found that there was no evidence that adding testing time improves student achievement. But if you thought that the administration’s admission meant that the problem was on its way to being resolved, guess again. Here’s a piece on this trend, by Lisa Guisbond, a testing reform analyst at FairTest. The push for frequent online or computer-based testing threatens to reverse recent progress in reducing testing and lower the stakes attached. In truly student-centered learning, children guided by teachers can choose among topics, materials and books based on their interests and passions. But the vision promoted by many education technology vendors and proponents is of students learning material selected by online or computer-based adaptive assessments. Companies and government agencies are amassing unprecedented amounts of student data through online learning and testing platforms. There is widespread concern about accessibility of this data to third parties and violations of privacy through data. Parent groups and others advocate legislation to provide transparency and protect data from misuse. In the meantime, security breaches or data sharing are serious risks. Frequent online testing creates obstacles to opting out as a way to call attention to and protest testing overkill. A robust national opt-out movement created enormous pressure for change. But a shift to online exams creates new hurdles for parents who want to opt their children out. After several decades, researchers have seen little positive impact from educational technology. Meanwhile, researchers warn of a range of negative consequences from overexposure to technology and screen time. These include damage to intellectual, physical and emotional development, threats to privacy, and, ironically, increased standardization. To fight the onslaught of packaged curriculum-plus-tests as well as personal data collection, parents and educators must learn more about the new ways technology is being used in the classroom. Parents can collectively demand transparency from schools, districts and states, either directly from teachers and administrators or through policy-making bodies such as school boards and education departments. Parents can request — or demand — that districts not purchase or require these packages and that their child not exceed a maximum amount of screen time per day or week. Parents, educators, students and their allies can organize for legislation that bars use of such packages, protects student data, limits screen time, and prohibits the adoption of expensive, unproven education technology. Parents can all demand that their children be allowed to opt out of interim or computerized, embedded tests. I agree with U of Arizona Professor Roberto Cintli Rodriguez who lays out why this election and presidency are distinctive even relative toward others to which they can be reasonably compared, namely, Richard Nixon, Ronald Reagan, CIA man George H.W. Bush, and later his son, George W. Bush. Even as we face the storm, our great work continues regardless. Happy New Year, everybody! We are in the midst of the holidays and I ask myself, what compels me to write when I should instead simply be enjoying the holidays? The answer: because the proverbial calm before the storm is upon us and it seems a bit too eerie for me. This past week, I filled out that professor watchlist petition because the times remind me of that Tagalog expression, Isang Balsak — when one falls, we all fall, and conversely, when one rises, we all rise. There appears to be a consensus that the incoming administration will be anti-education in general, anti-academic freedom specifically, and even more so, that it will be hostile to undocumented students. In these past few days I have read and heard an inordinate amount of pleas to keep at least a few days free from politics, if not the entire holiday season. This is no different than every year, except this year feels different. They appear to be nervous pleas. Without question, there is definitely something ominous in the air. When actor Ronald Reagan, and CIA man George H.W. Bush, were elected president, in 1980, 1984 and 1988, respectively, a similar feeling gripped the nation. The same goes for George W. Bush, in 2000, when half the country viewed his victory as part of a coup, and again in 2004 when his nightmarish ways of worldwide war continued. The same could be said before the days before Richard Nixon took office in 1968 and 1972. The apprehension turned out to be justified as they all turned out to be warmongers in the tradition of U.S. imperialist leaders partaking in a modern version of manifest destiny, which has resulted in millions of casualties in Asia, Africa and the Americas. And yet there seems to be something radically different about this incoming president. So why is this president-in-waiting being perceived as even more dangerous? The short answer: he seems to be the embodiment of the Ugly American. He is nasty, rude and offensive, the antithesis of, as he invokes, “politically correct.” While the other presidents listed here have advanced similar policies, they have arguably been civil, whereas the incoming president is actually pompous about being the Ugly American. But it is beyond that. Some of those policies include waging wars against weaker nations, never against nuclear-armed nations. And on the homefront, it includes carrying out the same anti-people of color, anti-worker, anti-woman, anti-LGBTQ, anti-science and anti-education policies that the incoming president has espoused. That being the case, why is there more apprehension today? One could argue that the only difference perhaps is that these previous presidents have hidden their biases and bigotry and were predictable, whereas the incoming one flaunts them and also appears to be unpredictable, unstable and narcissistic. It is uncontested that he lost by some 3 million votes, so it is not that the majority of Americans voters support him; it is that his supporters are easily moved and incited by his hate, rhetoric and beliefs. Just since the election alone, the Southern Poverty Law Center has documented more than 1,000 bias-related incidents. Feeling unconstrained, we are likely to see a rise in right-wing hate, violence and vigilantism. At the same time, there may even be no need for vigilantes as the government itself and its official forces may be those that will enforce his proposed unconstitutional or amoral policies, particularly against those peoples he has already been belligerent with, including against his perceived enemies. Dissent and mass protests may perhaps no longer be tolerated. Again, those presidents mentioned above did as much, thus, why the extra apprehension? Perhaps that is the point. Still fresh on many peoples’ minds are the illegal wars, invasions and military coups this country has carried out and supported, just since Vietnam. Still fresh on peoples’ minds are the wars at home that targeted activists of color and the progressive movement. And still fresh on peoples’ minds is the War on Drugs that has resulted in the tenfold increase in the U.S. penal system since 1970, an institution that has become virtually a warehouse for people of color. Perhaps that is the reason for the trepidation. There has been a general perception that, as a nation, we were moving in a positive direction in which there would be less war, more human rights, less brutality, and less incarceration. 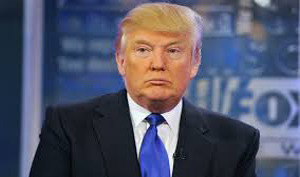 With the incoming president, it appears that instead there will be a radical acceleration. Perhaps people should be celebrating during this holiday season, though truly, people should also be preparing for what is to come, as opposed to simply withdrawing. On Inauguration Day, on colleges and universities across the nation, there will be walkouts, cancelled classes, teach-ins, rallies, and marches. The question is, what will be the “new normal” thereafter? 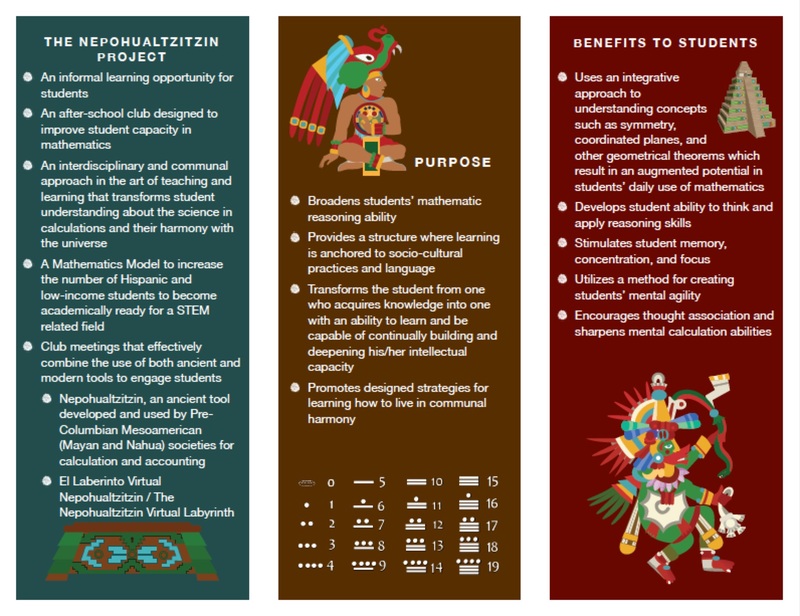 Let's give math mind-blowing depth and meaning: Introducing "The Nepohualtzitzin—the Mayan abacus"
If our societal well-being is to continue, we must educate our historically underserved youth. Particularly for minorities, mathematics is a big problem and major gatekeeper for success at the community college level with nearly 60 percent annually entering ill-prepared for college-level math requiring them to take many hours of non-credit bearing developmental math classes. It is shocking to read that of these, only 20 percent "go on to earn college math credit within three years." Aside from other reasons that come into play compromising college graduation for the under-served, clearly poor math skills and getting caught up in the dev-ed conundrum is both personally and financially costly. In the Brookings Institution blog post included below, author by Kathryn Barron, she cites Parmley and Smith, who make the case for using "continuous improvement methodology" for increasing graduation rates. Of the 11.6 million new jobs, 95 percent required a degree or other postsecondary training, according to the Center for Education and the Workforce at Georgetown University. Most of the jobs held by workers with a high school diploma or less that disappeared did not return. Within three years, more than two-thirds of all jobs will require at least some higher education, but the Center at Georgetown warns that, at the current rate, the nation is facing a shortfall of 20 million degrees. Continuous improvement methodology sounds helpful if not essential as a floor of what must be done, but for larger impacts, it's clear that we have to cultivate a love of mathematics in the earlier grades. My recommendation? 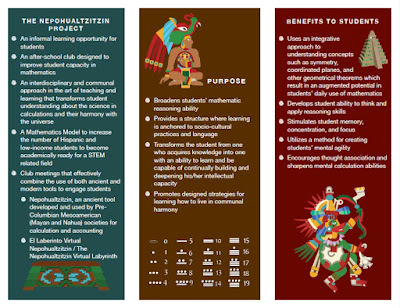 School boards and school districts should consider ethnomathematics which is a growing sub-field of mathematics that overlaps with what some know as "social justice mathematics." 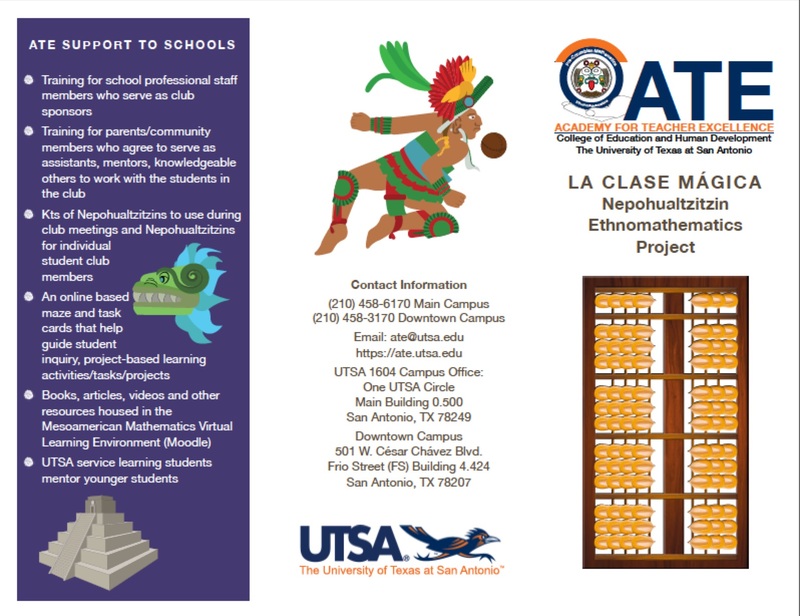 Since we actually have a local opportunity located with the Academy for Teacher Excellence (ATE) at the University of Texas San Antonio my preference is for old-age mathematics indigenous to this continent to get taught here and everywhere. This is the same math that built the meso-American pyramids, my friends, and it's called the Nepohualtzitzin (5 syllables here: ne-po-hual-tzi-tzin)—or more simply, the Mayan abacus. 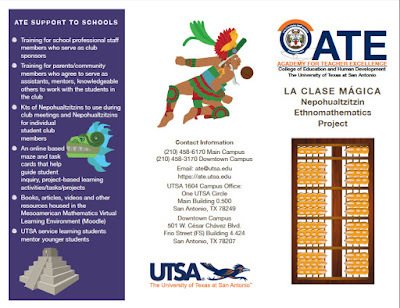 It is currently getting taught in a few San Antonio Area ISDs and Los Angeles USD schools in the context of after-school programs called "Nepo Clubs." Aside from higher test scores, most importantly, is a love of mathematics that children in these clubs are enjoying. 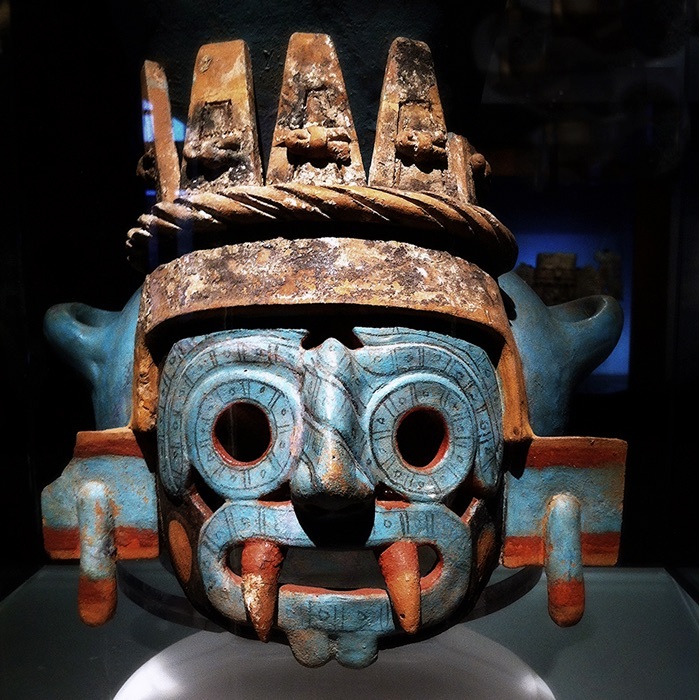 In San Antonio, it is also getting taught with basic Nahuatl together with some aspects of Mayan philosophy or cosmology that situates this curriculum in context. In addition to this helpful brochure, you can learn more about from these helpful links to access the promotional video and resources that are located in the ATE’s e-Community of Practice (I think you have to sign up for your own account). I have seen demonstrations of this by colleagues Dr. Lorena Claeys, Dr. Margarita Machado-Casas, and master teacher Karina Lares—and it sings! Let's make this happen friends! Let's first make math awesome. Let's give math mind-blowing depth and meaning and everything else will fall into place! Editor’s note: This is the second of three blog posts based on a series of articles produced by the Brookings Institution that make recommendations for an appropriate federal role in education policy. Today, we highlight a memo aimed at improving high school and college graduation rates, co-authored by Kelli Parmley and Marshall (Mike) S. Smith of the Carnegie Foundation. Economic growth following the financial crisis of 2008 contained a lopsided recovery that illuminated the critical need for more college graduates in the United States. Of the 11.6 million new jobs, 95 percent required a degree or other postsecondary training, according to the Center for Education and the Workforce at Georgetown University. Most of the jobs held by workers with a high school diploma or less that disappeared did not return. Continued economic growth will be stunted unless the nation steps up efforts to increase high school graduation rates and ensures that those students are prepared to be successful in college. Within three years, more than two-thirds of all jobs will require at least some higher education, but the Center at Georgetown warns that, at the current rate, the nation is facing a shortfall of 20 million degrees. High school and college graduation rates are increasing, but not by enough, especially for low-income, Hispanic, and African American students. While the high school graduation rate for white students is 88 percent, it’s only 73 percent for black students and 75 percent for Hispanic students. The inequity deepens at the college level, where, according to the U.S. Department of Education’s Digest of Education Statistics, about 57 percent of Asians and 40 percent of whites hold a bachelor’s degree or higher, making them about twice as likely to earn college degrees as African American and Hispanic students. Yet, there are strategies that work to improve these outcomes, note Kelli Parmley and Marshall (Mike) S. Smith in their report, Improving and equalizing high school and college graduation rates for all students. It’s part of a series by the Brookings Institution of 12 Memos to the President on the Future of Education Policy. Where are the leaks in the college graduation pipeline? Parmley and Smith identify three “critical junctures,” or leaks, in the graduation pipeline where students are most at risk for dropping out or ending their formal education. The impact of the opportunity gap on education equity is an underlying factor at each point. High school graduation: After being stuck for decades, the national high school graduation rate reached 82.3 percent in 2014. However, there is still a way to go to reach the 90 percent goal by 2020, set by GradNation, an alliance of education and civic organizations. Although black and Hispanic students are primarily responsible for the increase, they still fall 15 to 17 percentage points below white students in high school graduation rates. Pre-college remediation (non-credit developmental math and English classes in college): Every year, nearly 60 percent of incoming community college students aren’t prepared for college-level math and are referred to a non-credit bearing developmental mathematics class. Only 20 percent of these students go on to earn college math credit within three years. Black and Hispanic students are significantly more likely than white students to wind up in developmental math. College graduation: Between 2004 and 2014, graduation rates fell slightly at community colleges, to less than 30 percent, and increased a bit at four-year colleges, to just under 60 percent. Hispanic students have bucked the trend at community colleges and are improving at a faster rate than white and black students. But at four-year colleges, black and Hispanic students lag behind white classmates by 22 and 10 percentage points respectively. The high schools and colleges that have successfully tackled these issues did so using the principles of continuous improvement. Instead of throwing a variety of single interventions at the problem to see if any stick, they took time to understand the processes and actions in their systems that created the problem, researched evidence-based strategies, adapted those strategies to their context, conducted rapid testing of interventions and adjusted them if necessary, and used data throughout the process as a guide. Fresno Unified School District in California’s Central Valley, with over 80 percent free and reduced lunch and over 75 percent Hispanic and African American students, used the continuous improvement approach to create a data system that notifies a student’s counselor if the student is off track for graduation or college preparation due to such factors as excessive absences, low test scores, or not being enrolled in college preparatory classes. Graduation rates rose from 70 to 84 percent from 2010 to 2016, more than double the national gains. Getting students into college is just the first step; preparing them to be successful has been more difficult. In its latest report on the issue, the National Student Clearinghouse Research Center found a decline in graduation rates between students who started college in the fall of 2009 — both in four-year and two-year colleges — from the cohort that entered in the fall of 2008. The actual number of graduates increased because the Fall 2009 cohort was larger than the previous year, but, by the same token, the number of students who left college without a degree or certification also rose. A key contributor to these lower completion levels is the dismal success rate in developmental (also known as remedial) courses. As noted above, 80 percent of students enrolled in these pre-college credit classes don’t pass them and, therefore, are locked out of their college, advanced credentialing, and related career goals. In recent years, however, different organizations and colleges have created alternative developmental education courses to address the problem. One of the most successful is Carnegie Math Pathways, which followed the principles of improvement science — such as seeing the problem as system wide, learning what students said was not working, and conducting ongoing measurement of interventions to quickly determine if they’re helping students and change the if they’re not — to redesign developmental math. With five years of implementation behind it, students in the Pathways courses have triple the success rate in half the time as students in traditional developmental math classes. Both Georgia State and Florida State Universities used data in a similar manner to Fresno Unified to track student progress and intervene when students were off course. Georgia State increased graduation rates from 32 percent to 54 percent between 2003 and 2014, while Florida State’s rate jumped from 63.2 percent in 1988 to 79.1 percent for the freshmen class of 2008. Black students at FSU pulled nearly even and Hispanic students slightly exceeded the overall rate. Set clear national goals for college graduation and encourage states to do the same, and see college graduation as part of a continuum that begins in high school by ensuring that students are on track and taking the classes that colleges require. Add a new title to the upcoming reauthorization of the Higher Education Act that provides resources for colleges to implement robust data systems. Partner with existing organizations engaged in this work to establish clear goals for high school graduation within four years and six years. Support legislation to improve existing K-12 state data systems so school counselors can intervene quickly when a student needs support. Use existing resources, such as federal education labs, to conduct research and development that provides more evidence of successful interventions. Colleges and school districts that have used continuous improvement to increase graduation rates, especially as a means of closing the graduation gaps based on race, ethnicity, and income, often do so locally, without federal or even state assistance. But that’s too heavy a lift for most places, in particular small districts and colleges that don’t have the financial or human capital to spare. Federal support, therefore, is crucial in scaling these proven interventions, note Parmley and Smith. Otherwise, it’s unlikely that colleges and high schools on their own will be able to close the 20 million shortfall in college degrees and postsecondary training that’s essential for the nation’s continued economic health.